Today , i present to you the stupidest game i've ever done. Just rub the bird and share your exploits on Twitter ! and is available for Android , OUYA , CAANOO, Wiz, PS2, Dreamcast and Windows. Hey guys , great news ! Rubby Bird was downloaded more than 2500 times in only 2 days ! 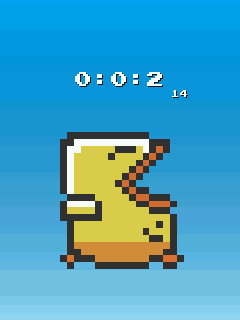 In case it went unnoticed , Rubby Bird is available for OUYA too ! It's also available in the Amazon AppStore and it's still on the Google Play. Congratulations for having the most downloaded BennuGD game in the Play Store! Actually , it was downloaded more than 15,000 times in only 13 days and has 416 Ratings. and the fastest downloaded BennuGD game. On OUYA , it was downloaded more than 200 times and is ranked 208th in the O-Rank. Anyway, your game and Streets of rage remake have this great numbers because original games are very famous (sor from sega and flappy bird). the first game to use it. Thanks ! I forgot about that game , very sad indeed. The CAANOO and the Wiz versions were not working well , Version 1.41 should fix this.